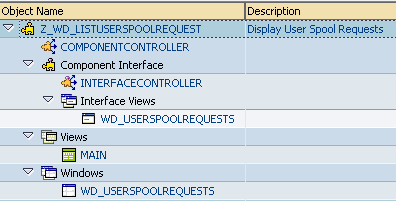 In this Web DynPro tutorial, ABAP developers find answers for "How to create Web Dynpro Application (Web Dynpro Component)" This WebDynpro article is part of a Web Dynpro tutorial showing how to list and display spool requests of a SAP user on a Web Dynpro table element. You can also refer to the article series for the missing topics not covered in this section. To summarize, this section will demonstrate how to create Web Dynpro application using SE80 ABAP Workbench editor for ABAP developers. Let's start Web Dynpro tutorial by creating the WebDynPro component first. First call ABAP transaction SE80 (ABAP Workbench editor). 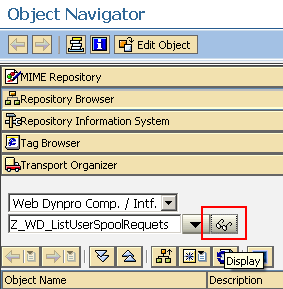 Then in the Object Navigator window, choose Web Dynpro Comp./Intf. from dropdown. Give a name to your web dynpro application. Then press Display button identified with red lines. 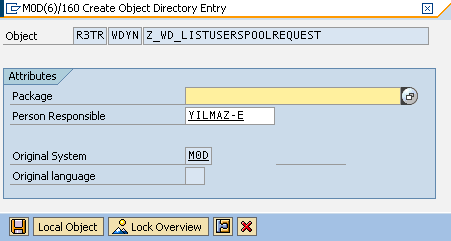 When you press Display icon, since there is no WebDynpro component named "Z_WD_ListUserSpoolRequest", the SE80 editor will ask you if you want to create a new Web Dynpro component with given name. You can change the default Window name or View name on this screen. When you are finished with Windows name and View name, press Enter icon for next step. Save your Webdynpro component as a local object or define a development package for your component. 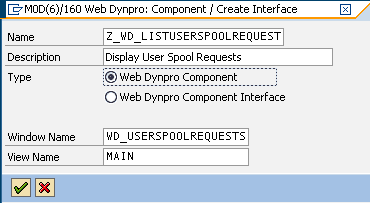 Now ABAP Web Dynpro software developers can build their Web Dynpro component. Just right click on the component name and choose Activate. When all development is completed, ABAP developers can create SAP transaction for Web Dynpro application or add Web Dynpro application to SAP favorites menu.